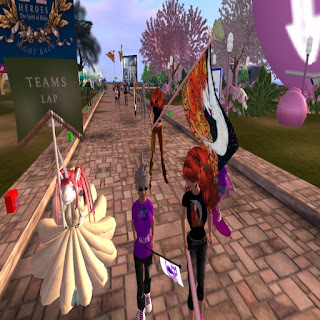 I have been in Second life a long time, over four and half years, and every day I learn or see something new within the digital universe that we all inhabit. A few days ago I spoke with Sabine McGettigan and her SL Partner Daaneth. They told me why they have red hair and what they are passionate about. Sabine herself has had breast cancer from 14 years ago, and Daaneth lost his sister to pancreatic cancer years ago. I shared with them both that I myself lost my mother to ovarian cancer many years ago. So this is certainly something I can get passionate about as well. I had commented that cancer is never fair as it threatens your life or someone that you care about. With that in mind Sabine and Daaneth aren’t super heroes like you about in comics, but heroes who dedicate themselves to doing all they can to fight cancer. Sabine and Daaneth head the Passionate Redheads, a Relay for Life group existing within the SL universe. Just like the real life version, the Relay for Life sponsors runners or walkers to raise funds for the American cancer society (Or ACS). Just like in real life the walkers have to walk a great distance, as they said 34 sims long. Daaneth admitted to staying up for 30 hours during the SL version Relay for Life and crashing afterwards. Volunteers like Shockwave and Lomgren built the Relay camp for the Passionate Redheads. The whole Relay is 24 hours, but the walkers take turns so not everyone walks the whole 24 hours. Sabine and Daaneth told me they have to prepare six months ahead of time starting around St. Patrick’s Day. Right now that’s not very far away. The whole event stops in the middle of July. All their extra effort pays off though. Altogether the lindens that the Passionate Redheads have raised in the last 5 years equals $30,800 in US dollars. Divide that by 5 and that’s $6,160 per year. On top of that Sabine and her team have won various awards for their hard work and passion. Sabine and her Passionate Redheads won Spirit of Relay Award and Golden Team Award two years in a row. Sabine McGettigan: “We're always in the top ten." One of the unique ways where the Passionate Redheads raised funds that two people who are furry like me changed to human avatars. As a furry I can say that is a huge sacrifice as I feel awkward if I’m not a fox or griffin. Rita herself raised 80,000 Linden in the "Bid me Human" event from the bunny avatar she has. Bixyl himself was a cowboy human to also raise Linden for their cause. Sabine McGettigan: Daaneth had a stroke 3 weeks into the Relay Season. Sabine McGettigan: He came back and could not type, so he used voice to help lead the team. I myself remember hearing Daaneth over voice chat at a Sunweavers event encouraging people to raise money for the ACS. His real life voice did sound broken, but still vigorous as he wanted his team to continue fighting. The Sunweavers is a furry group which holds various events on Rita’s sim. Many of the Sunweavers have joined up with the Passionate Redheads. For Daaneth’s amazing attitude and refusal to give up after his stroke he was given an award. Sabine McGettigan: Then last year Daaneth won the most special of all: The Spirit of Relay Individual Award. Cancer is something that devastates or has devastated people in their life and their families and friends. For myself I lost my mother and Sabine it threatened her life. For Daaneth it took his sister’s life. Thank you grease,Great article. Go Relay! Go Redheads! Our Team is filled with gratitude for your beautiful tribute, Grease. Your story is certain to bring new faces to the Relay for Life. By working together, we can make a difference!